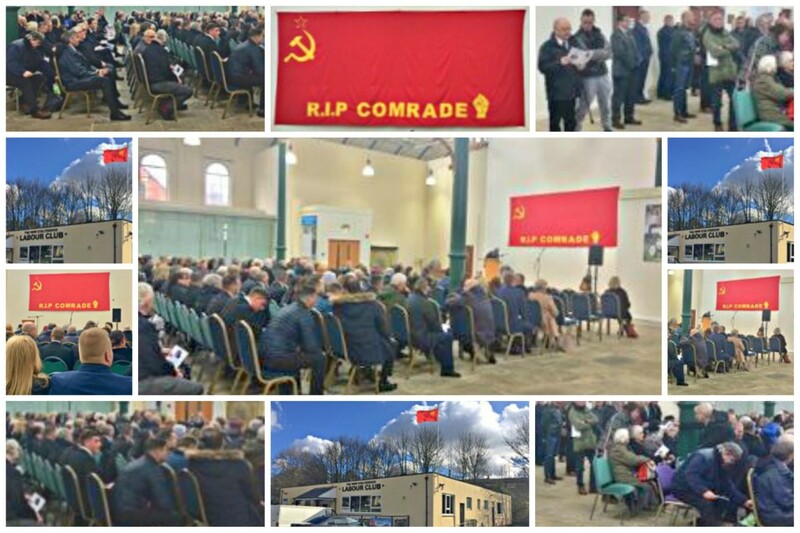 Northern Voices: Tameside Tories see RED over Communist Party funeral flag! Tameside Tories see RED over Communist Party funeral flag! A major row has erupted over a families right to display in public, the Communist Party flag, in memory of their father, who was a lifelong communist. Last Thursday, over 300 people attended the memorial service to Rodney (Rod) McCord at the Stalybridge Civic Hall. A local health campaigner and member of Stalybridge Labour Party, Rod died in Willow Wood Hospice, on Wednesday 15th February 2018, aged 67. Later in the afternoon, a service took place at the Dukinfield Crematorium. Originally from Openshaw, Manchester, Rod was one of three children of Phyllis and Charles McCord. Along with their father, Rod and his two sisters, Christine and Marilyn, were all members of the Communist Party (CPGB). Rod left instructions that the Communist Party flag was to be draped over his coffin and a communist banner with the hammer and sickle and "RIP COMRADE", was displayed in the civic hall. The Red Flag and The Internationale were also played at the service and relayed out into the street. Afterwards, family and friends retired to the Stalybridge Labour Club, where £1,348.94 was collected for Willow Wood Hospice. To show honour and respect to their father, the McCord family, decided to display the CP flag on the flagppole at Stalybridge Labour Club to "mark our Dad's passing." A local busybody Stalybridge councillor, called Doreen Dickenson, a kind of priggish, parochial, Mrs Grundy type of character, got wind that something rather communist and lefty was going on in her own backyard of Stalybridge. Even before, Mr McCord had been laid to rest, she was scurrilously tweeting about how un-English and alien it was to display communist flags and play communist songs, in this little northern cotton town. Although Dickenson, later removed the offending tweet, after being contacted by the McCord family, she said she'd received complaints from constituents about the 'Communist Party Flag' and communist music being relayed outside by loudspeakers that she found disgusting. She also seemed to think that because the event took place in a public building (which the family had hired for the occasion), they had no right to fly the flag or play music. "Rod was a truly lovely person, generous, intelligent and warm. 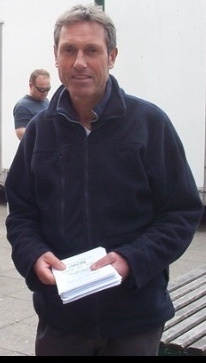 Many people will know him in particular for his work with Tameside Hospital Action Group... I always thought he was one of the most well read and informed people I ever met. There was a great turnout today, and Rod's sons and grandchildren all gave magnificent tributes to him. Dave Ormsby gave a brilliant eulogy, which was funny as well as poignant. Rest in Peace Rod." "It has gone viral and caused a furore on social media, something that should not have happened. It was the funeral of a very stalwart person who sat on the Tameside Hospital Action Board (sic) and did a lot of good work in the community. People are dying all over the world and struggling to put a loaf of bread on the table, yet flying the flag has caused all this fuss. There are more important issues." The McCord family later issued a statement saying that it was not their intention to cause offence, upset, or to associate the flag with the Labour Party. I don't suppose that any of us should be surprised at the foul antics that the Tories and the far right are prepared to stoop to in order to make political capital over their opponents. Even the death of a truly decent man, and the respect his family paid to him, is something that cannot take place without controversy or be exploited for political gain. Some have even tried to connect this flag incident with the recent poisonings of Yulia and Sergei Skripal. But what should one expect from a party that snatched milk off the school kids and now threatens to take their free school meals off them, if their family earns more than £7,000 per year. We understand that the manager of Stalybridge Labour Club received death threats following this incident. We also understand that someone in the office of the Labour leader, Jeremy Corbyn, contacted one of Mr McCord's son's, demanding that the communist flag be taken down and that when he asked to speak to 'Jeremy', he was told he was out at a meeting. This seems rather cowardly and gutless action from a party that proclaims itself to be socialist. Needless to say, the party must have found it a political embarrassment. Despite being embarrassed by a red flag, the Labour Shadow Chancellor of the Exchequer, John McDonnell, says in his 'Who's Who' entry, that his hobbies include "fermenting (sic) the downfall of capitalism." In 2011, he called on unhappy workers to spit in their bosses tea. Clearly, the pragmatic politician lies behind many of these hard men on the left. And what would my dear friend Rod McCord, be making of this right now? I bet he'd be laughing his little red socks off. He certainly went out with a bang! RIP mate. Now he blushes about a Red Flag hanging over Stalybridge Labour Club. Can this be the same man who threw Mao's 'Little Red Book' across the despatch box in 2015 or who in 2014, spoke approvingly of the Tory MP Esther McVey being lynched? Hi Derek, read the article; brilliant. Rod has gone out with a bang. I may attach the flag to my next piece to the media. Regards, Paul Broadhurst. Excellent! This article defends Rod's good name and the decent intention of his family's final act of respect to honour him in the way that they did. I hope Doreen Dickenson does her homework in future before causing uproar on social media again by getting her facts right before she goes jumping to conclusions and starts spouting assumptions - a person in her position ought to know better. I am heartened at how the author of this report has leapt to his good friends defence and has finally put this whole sorry situation to rest. Ironic, really, when after all, this was only what the family were trying to do in the first place.